In the ancient medinas of Morocco old Riad doors have become much sought after items by tourists and collectors along with new riad owners. Riad doors are in particular famous for their unique architectural design and colors in Marrakech,Fes and Essaouira. 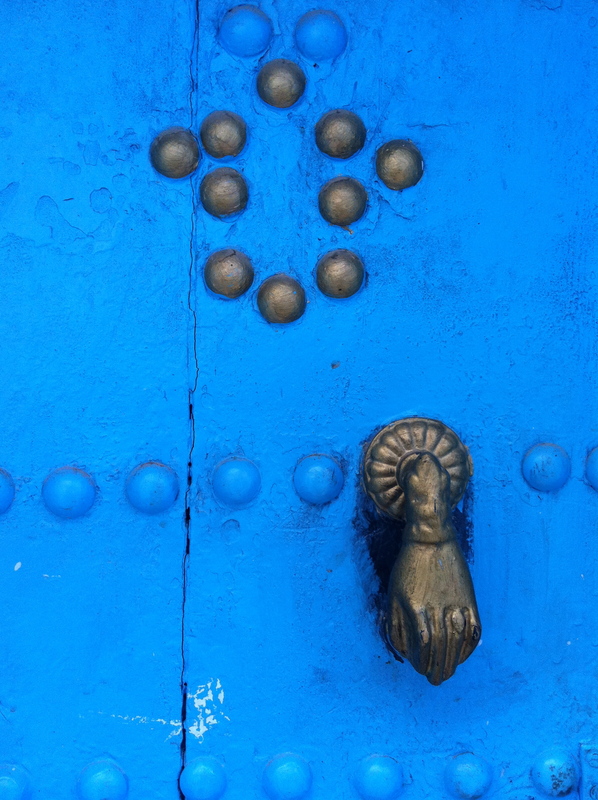 Other Moroccan cities in the North such as Asiliah and Chefchaouen also have medinas with charming door knockers that standout against their rich blue doors and city backdrop color. In Marrakech these doors they can be found in antique door specialists, craft shops and at the Bab el Khemis or Thursday market by the northern medina gate. Once a prized door has been negotiated and purchased, the adorning piece to complete it is an ornate brass knocker which in itself is now a sought after collector’s item created by skilled craftsmen in brass or wrought iron. 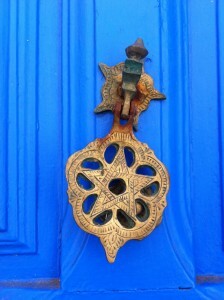 Door knockers in Morocco are an important part of the character of the medina and a symbol of divine protection for the home. They are an important expression of Moroccan cultural traditions and symbolism. The first contact with the riad or house you are entering in the Medina is the brass knocker which you tap to gain entry, it’s a refreshing change from the world of door bells and entry phones. 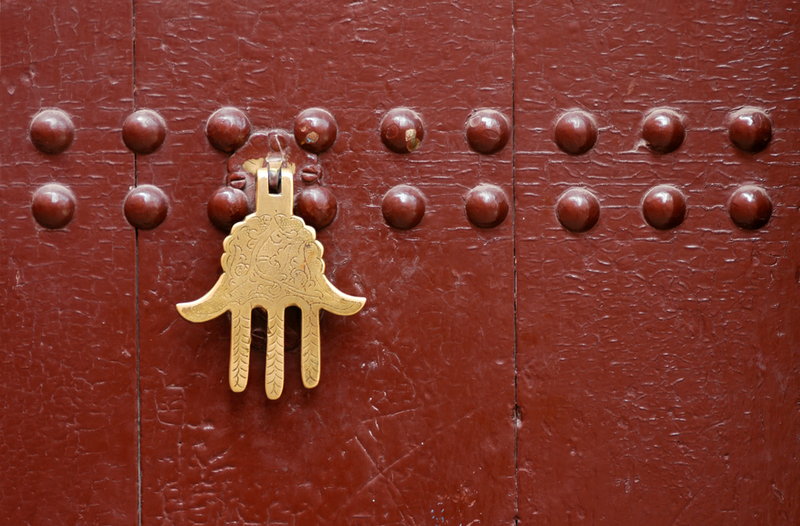 Often the solid brass or caste iron knocker will take the palm shape of the Hand of Fatima often referred to as the figure five for the fingers and thumb of the right hand, Khamsa in Arabic. It commemorates the Prophet’s daughter Fatima Zahra and is believed to ward of the evil eye. It also appears in Levantine Christian mythology as the Hand of Mary and in the Jewish tradition the Hand of Miriam the sister of Moses and Aaron. 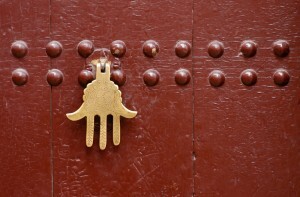 The five fingers that appear on a Moroccan door knocker or a Khamsa refer to the five books of the Torah to Jews, the Five Pillars of Islam for Sunni Muslims . The symbolism of May, (fifth month in the year and sacred to Mary for the Christians). The fingers of a Khamsa may point up or down. There are Jewish mellahs in all Morocco’s medinas as Morocco had a sizeable Jewish population for centuries until the 1960’s and Essaouira’s Jewish community made up 40% of the total population in the early 19th century. 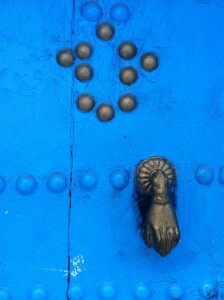 Jewish symbols decorate the Mellah and Jewish craftsmen and artisans, particularly the silver jewelry have influenced Moroccan metal work for generations. Morocco’s skilled craftsmen are renowned for their brass work and if you have a copy of a design you would like to use they can usually make it for you. Door knockers in Morocco’s magnificent royal palaces have also played their part in the exotic traditions of door knockers. Moroccan metal craftsmen in brass and caste iron are a source of skilled invention drawing on ancient traditions and design which draw their inspiration from as far a filed as Damascus with its legendary metal work. Marrakech in particular is also the home of highly original Moroccan and European designers who blend ancient and modern. 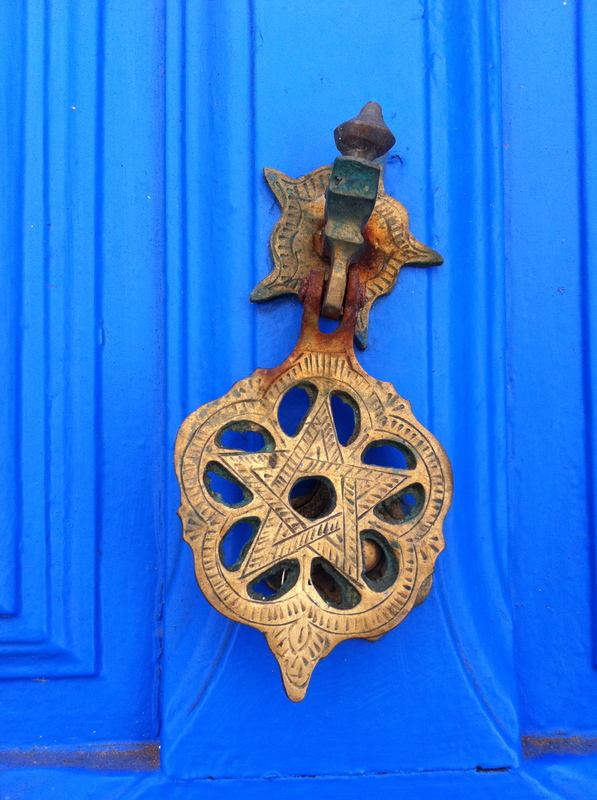 Whilst there are very few articles on Moroccan door knockers they are on sale on the internet on a number of different websites such as Tazi Designs in San Francisco which is a sure sign of their popularity. Riad Star opens in September 2013 after two years of renovation by a team of Marrakech’s finest craftsmen. It was part of the palace once owned by the Pasha of Marrakech, Thami El Glaoui who in the 1940s invited Josephine Baker to live there. She was inspirational vaudeville star, singer and dancer of the jazz era. She was also a French resistance heroine and civil rights pioneer to come and live in it and Riad Star’s seven rooms have been decorated in Art Deco style with memorabilia sourced from the Parisian music halls of the twenties and thirties. Riad Star is a unique addition to Moroccan Riad and Boutique Hotel offerings. The Riad is attached to the former Menebhi Palace which is now the Marrakech Museum, for many years it was used to accommodate distinguished guests. Following a painstaking renovation, Riad Star now continues that tradition of hospitality as a boutique Riad hotel with just seven guest rooms. Riad Star blends traditional Moroccan style with Art Deco and modern elements. The riad has original cedar woodwork, exquisite hand carved plaster and a host of other features have all been retained while discretely incorporating air conditioning, Wifi, power showers and other creature comforts. The individually named rooms include the Josephine. Unusually for Marrakech this room has a window onto the street. It is believed the Pasha of Marrakech paid children to sit outside Josephine’s window and read for her while she was convalescing. A private roof terrace offers a further seating area with outdoor fireplace, a space to relax and loungers to soak up the Marrakech sun. Best of all is the Riad’s hammam and massage suite, the ultimate Marrakech luxury just a few short steps from the comfort of your room. 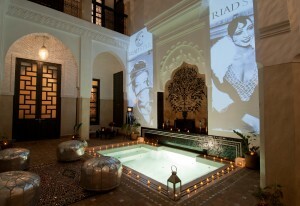 Riad Star offers extremely versatile accommodation. All rooms can be double or twin, most can be triples making the Riad perfect for groups of friends. The Josephine and Star rooms can interconnect which is great for families. The dining room features full length mirrors and makes a stunning dance studio. The dipping pool can be covered leaving the patio free for yoga, or special occasion parties. There is also the option of covering the patio with a secret rolling roof guaranteeing the success of your event in all weathers. The Riad Star Collection comprising memorabilia, art and documents celebrates the Music Hall era and the extraordinary life of Josephine Baker. Highlights includes a stage costume created for Josephine’s spectacular last performance by Andre Levasseur from a design by Niki de Saint Phalle. A 19 page manuscript, hand corrected by Josephine, setting out her ideals and her vision of universal brotherhood.Letters, news cuttings and photographs from throughout Josephine’s career including a polaroid taken in the kitchen at the Chateau des Milandes with her Rainbow tribe of twelve adopted children.A stage costume created by designer Gessmar for the legendary singer Mistinguett around 1920, a jewellery box and Costume Jewellery belonging to Mistinguett.Gauches by Erte, Wittop, Bib, Zig, and other leading designers for the Casino de Paris. Some of these items may be on loan to international exhibitions. If you want to enter into the spirit of the roaring twenties you can find costumes, many of which were worn on the Paris stage you can wear in a dressing up cupboard. English owners Mike and Lucie Wood are passionate about sharing Josephine’s vision of the potential of the world’s peoples to live together in harmony. There is no better place to appreciate diverse cultures than Marrakech, an ancient trading post which sits at the intersection between Europe, the Arab world and Sub Saharan Africa. 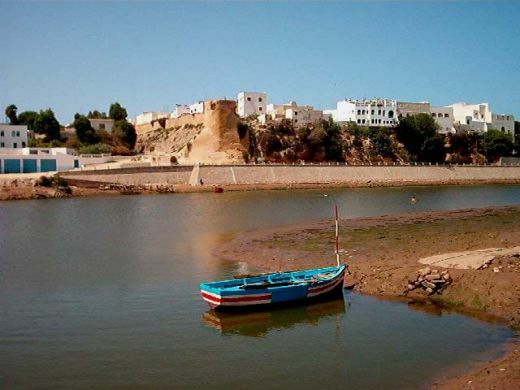 Azemmour is a charming former Portugese fortified town on the great Oum Er-Rabia river 75 km from Casblanca and close to the fortified city of El Jadida which the Portugese moved to after abandoning Azemmour in 1541. The Duke of Braganza took the town in 1513 with a force of some 500 ships and 15,000 troops. It was used as a destination for shipping goods along the river. Azemmour is unspoiled and a very restful destination of character in Morocco. The views from its ramparts and walls which rise up from the river are striking. Its white Medina and ochre walls seen from the three bridges that cross the river are very picturesque. The town is refreshingly calm and gives first time visitors to Morocco a good idea about the tranquil Moroccan way of life in a small town. The old Kasbah is mostly a ruin with striking views cross the river and gardens from the rampart walls. The prominent Dar El Baroud tower is all that remains of a gunpowder store that was destroyed. The Moroccan built Medina is reached via Place de Souk and a 16 century gate with a European semi circular style arch. Azemmour had a substantial Jewish population which left in the 1960’s and the old Mellah or Jewish quarter lies in the northern part of the Medina after the Kasbah. The old synagogue is well maintained and looked after by a local family and it is possible to see inside where lies the tomb of Rabbi Abrahim Moul Nis, which is an important shrine for Jewish pilgrims and is the focus of a Mouassem each year. The patron saint of Azemmour is Abu Shuayb Ayub Ibn Said Erredad al-Sanhaji Assariya , who died about 1177. His mausoleum was built on the order of Sultan Mohammed ben Abdallah. 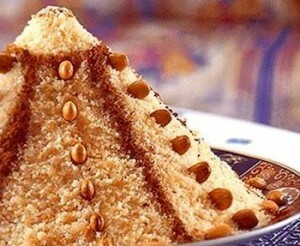 Each year a moussem is celebrated to honour him. The Azemmour festival is held each year in July. There is the Restaurant Panorama with a delightful garden serving Moroccan cuisine and La Perle restaurant on Hauzia beach across the river from Azemmour . Hauzia beach has kite surfing, although the river has strong currents and care should be taken. The wetlands by the beach have a variety of bird life for bird watchers. A visit to Azemmour can be combined with a trip to the Portugese fortified medina of El Jadida giving the visitor a good idea of the Portugese architectural heritage and naval prowess in the sixteenth century. The Portugese presence in Morocco declined after their defeat at the battle of the three Kings at Kasr el Kebir in the north of Morocco in 1578. Seffa Medfouna is a famous Moroccan dish. 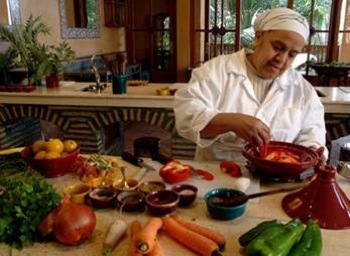 When traveling to Morocco for a Cooking Vacation or to take a Moroccan Cooking Workshop Seffa Medfouna is one of the options that Moroccan travelers can learn to make. 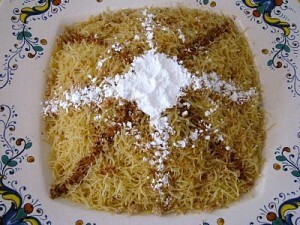 Seffa Medfouna is made with crushed or fried almonds, cinnamon, raisins, fine vermicelli noodles and powdered sugar. Seffa Medfouna is typically served in Morocco before a meal. This light and tasty dish of Seffa Medfouna can also be made with beldi chicken, lamb or beef. When served with meat this traditional Moroccan dish can be used as a meal. 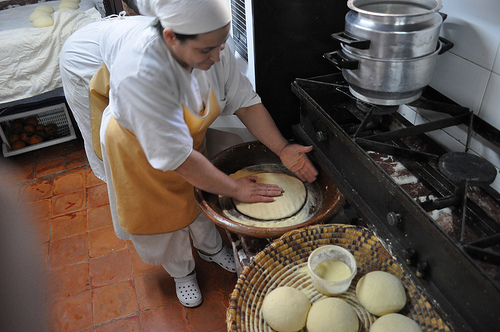 Seffa Medfouna is made slightly different in each region of Morocco and its ingredients vary also by season. Seffa Medfouna is a Moroccan favorite with some of the best found at Ines Guest House located in Tingerhir not far from the mouth of the Todra Gorge region of Southern Morocco. Step #1: Boil 2 litres of water, with lemon juice, added into a large saucepan. Step #2: Place fine vermicelli noodles into flat and large plate, with oil. Transfer them into a couscous steamer and cooking over moderate heat for approximately 20 minutes. Step #3: Remove steamer and place the fine vermicelli noddles into a large place. Spray with 1 glass of salted water, mix well and run hands through to remove any knots that were created. For the second time, place the vermicelli noodles into a steamer. Repeat until the vermicelli noodles are completely cooked. Step #4: Clean and rinse raisins. Add raisins to vermicelli prior to last steaming and cooking step. Step #5: Place vermicelli into a flat large, round dish. Add two table spoons of butter, let it melt and mix. Step 6: Scatter crushed or fried almonds, cinnamon and powered sugar on top of dish. Moroccan Seffa Medfouna is easy to make and can be learned at a cooking workshop on a Moroccan Vacation or at home on your own. Morocco Travel Blog has been nominated for the Moroccan Blog Awards under the category of MOROCCO TRAVEL BLOGS – TRAVEL. To vote for the 2010 Moroccan Blog Awards click here http://moroccoblogs.com/ and cast your vote for “Morocco Travel Blog” under BEST OF MOROCCO BLOGS – TRAVEL. The Morocco Travel Blog was created in December 2008 by Alecia Cohen a Moroccan Travel Specialist and former magazine publisher of eighteen years. Morocco Travel Blog’s goal is to offer A Sensual Journey to Morocco through stories and photographs. With so many new travel blogs on the frontier and blog software available to enhance blogs, what is still lacking are travel blogs that are written not only with passion, but those that include journalistic and photographic expertise on Morocco travel, the culture and its people. Traversing the country of Morocco can be done on a private 4×4 tour, bus or train however Westerners who want to explore Morocco with ease and comfort need to consider researching their best private tour options online through professional Morocco Travel Agency websites and Morocco Travel Blogs. Morocco Travel Blog seeks not only to offer an authentic reading and visual online experience but to take its readership into another world where they can instantly become an arm chair traveler on a Moroccan Adventure to the Sahara, an exploration to Morocco’s Imperial Cities or journey into the lives of Nomads in Berber Villages within the Middle Atlas Mountains of Southern Morocco. Morocco Travel Blog is the perfect read for those who are interested and passionate about the Maghreb. 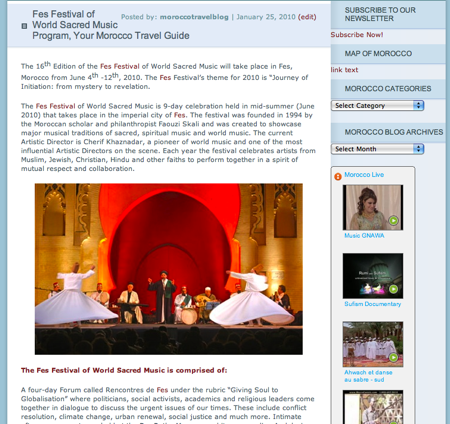 The Morocco Travel Blog shares with its audience entertaining and informative content about Morocco’s natural wonders, Morocco’s ancient monuments, kasbahs and art museums, Morocco’s Music Festivals (Fes Festival of Sacred World Music, Gnaoua Festival and Sufi Festival), as well as the colorful souks of the Maghreb and positive social and artistic changes Morocco is undergoing as a country. Morocco Travel Blog offers fascinating articles and high end photography that give YOU a true taste of Moroccan hospitality through lively, interesting and heartfelt stories about Morocco. Morocco Travel Blog welcomes visitors and subscribers of the blog to submit their own posts, comment on the visual elements and written stories plus learn more about the beauty of Morocco. 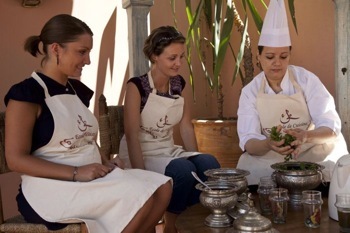 Morocco Travel Blog’s sister company Travel Exploration Morocco is a Morocco Travel Agency that specializes in Morocco Tours, Morocco holidays, Morocco Travel Excursions and boutique trips that enable travelers to engage in an authentic experience with Morocco’s culture and people. 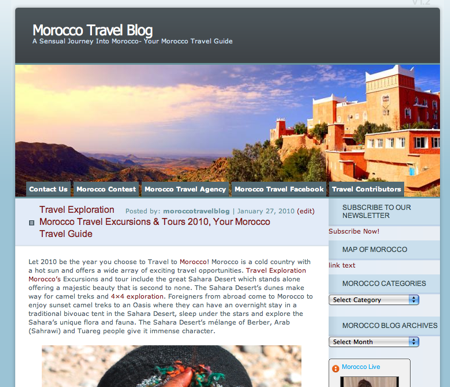 To participate in posting content and stories at Morocco Travel Blog email our Director Alecia J. Cohen. If you are interested in a Morocco Tour, it would also be our pleasure to help you plan your next Morocco adventure. You are currently browsing the archives for the Morocco Tour category.